Your mommy's closet is the best place when searching for vintage, agree? It's awesome every time I dig into my mums wardrobe I find so many interesting stuff that she NEVER wears. I can now happily say that this pretty black oversized coat is mine now, haha! :) It fits perfectly and I love the extra zipper detail they added to the sleeves. By the way, the Chicwish $ 100 voucher giveaway is now extended till next wednesday 10/4 so you can still enter it! This looks pretty amazing!! I love the whole combination.. Black & white with some elegant touchs of color looks so amazing! love the outfit, your hair, and that pop of teal is just perfect, take care! I love the black and white with the pop of green. Adorable clutch and you look beautiful! Great pictures as well! You are gorgeous and I love your outfit especially your clutch! so chic look! love your pants! So elegant!awesome coat & watch! Maybe you would want to visit my blog while having some free time:)) NEW POST! nice blog!would u like to follow each other? so in love with your clutch! it´s alwys fun to search in mom´s closet I guess! You look stunning dear, love the outfit and the bag is absolutely amazing(looooove the colour). Love your outfit! I would never have the chance to or even be able to find anything I like in my mother's outfit. None of her clothes would even fit me. Gorgeous! love this outfit and the flash of green. 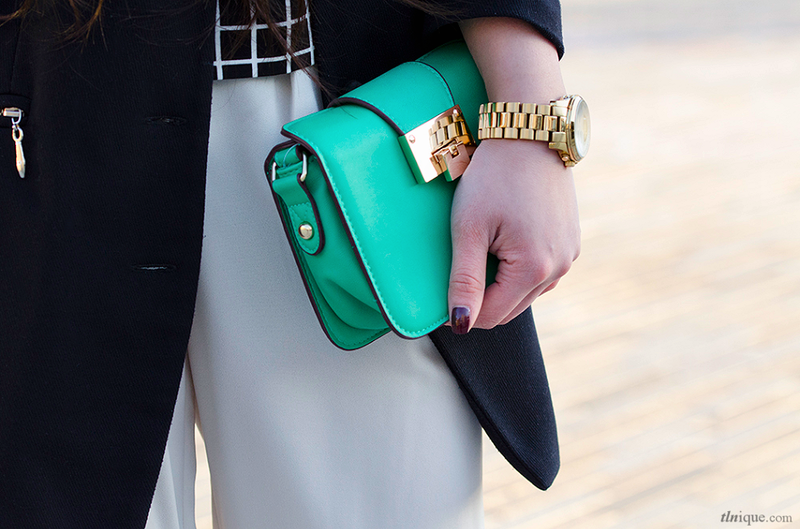 That little mint clutch is seriously perfect. Love it! Love the outfit, specially the clutch. Amazing outfit and lovely clutch! I like your green bag! Such a chic outfit, you look amazing! I love your hair! It's so flowy haha, and yup mommy's closet is full of treasure! beautiful look, love that top! Love this look!!! Your clutch is gorgeous, love the colour! Love your outfit and that bag is soo beautiful! In love with that clutch! You always look so perfectly put together. You look so pretty! Love your outfit as well. I'm a fan of that bag, such a nice colour! Your hair looks beautiful as always. I am in love with your blog and style! Your hair is gorgeous! Thanx for the lovely comment on my blog, be sure to keep in touch! Great styling! 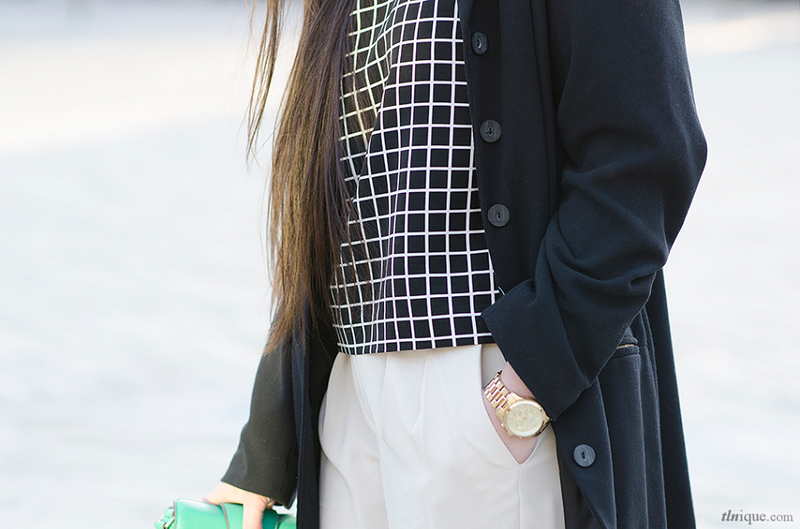 Love the monochroamtic outfit and I say a big yes to the color splash with the clutch! I always admire people who can pull off wide legged trousers very well (that's you!) I love the pop of green from the clutch ! love your style. I'm following you( gfc, bloglovin). love this look! I love seeing pretty women with wide legged pants. classy! amazing photos, you look beautiful! Great photos always enjoy seeing your posts! very beautiful fotos! so elegant! Btw you look so stunning, that outfit is so stylish on you :) You are a model, those trousers are so amazing!! OMG!!!! How chic you are!!! Glad to find you among so many blogs! No doubt following you since now! Amazing outfit, you look gorgeous. I love the color of the hand bag. Awesome hair!! Love it<3 and I love your style! Great outfit !! I love the shirt !! love your shirt and clutch!!! thanks so much for your lovely comment! maybe wanna follow each other? let me know! I love the vintage jacket that you find in your mom's wardrobe.You look great in this outfit. I love the jacket - what a find! and entered your great contest! thanks for coming by! i'm following YOU now! I love how you kept everything all black and white and then added that minty green pop. Lovely! Thanks for the comment on my blog! I love your blog and I'm following it now! Wowzers! Can't take my eyes off your stunning hair!! And, this boxy little window pane top is wonderful! Beautiful! Love the shirt and the shoes! I love your classy and elegant look. You look amazing dear, I love your style!! Great pictures, great outfit and amazing clutch! btw would you like to following each other? love your poppy clutch bag! Love the top! Fantastic outfit!